Samuel Castro for "When in Travel"
The hotel is situated right at the city center with direct access to the Phloen Chit BTS (Skytrain) station. Guest rooms were designed to take advantage of natural daylight, with expansive windows and the most modern conveniences. A touch screen bedside control panel and internet on TV makes life just a little easier while comfort items such as walk-in closets and oversized tubs brings suite-like facilities to even basic room types. 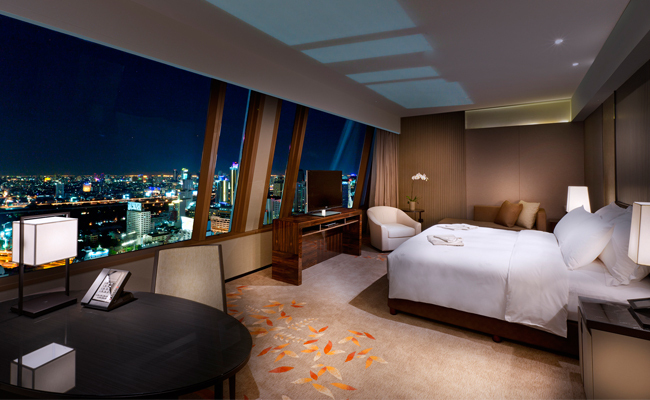 After a long day, unwind at hotel’s spa, an oasis high above the city. The Okura Spa uses the best of Thai and Japanese treatments to pull, knead and stretch out the grind of daily life. 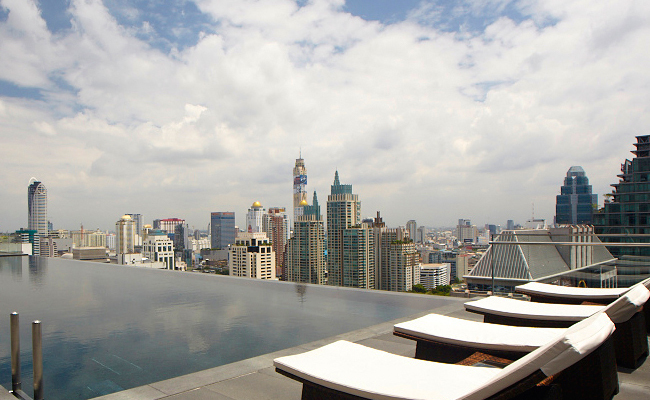 Of course, one cannot leave without spending time by the cantilevered infinity pool. The photogenic spot is one of the building's most noted architectural elements, but if you're prone to vertigo—don't look down! 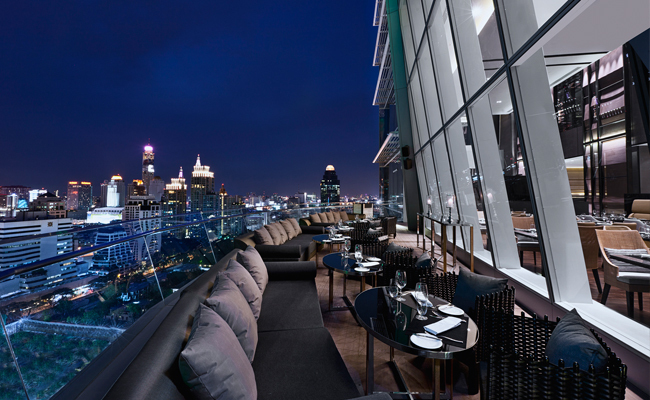 The Okura Prestige Bangkok has four dining outlets. For breakfast and all day dining, Up &Above Restaurant provides international dishes served with uninterrupted views of downtown Bangkok. 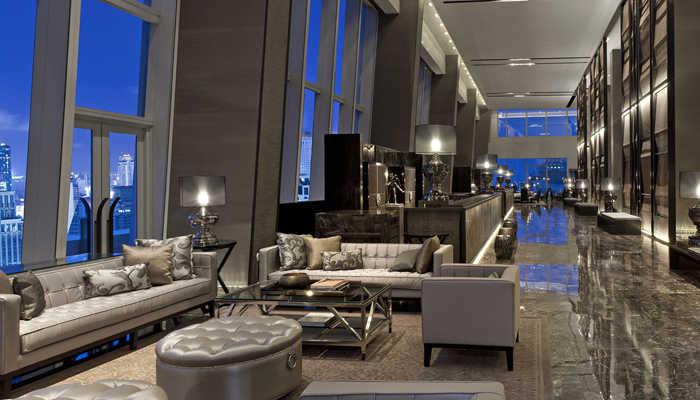 What is sure to become of one the city's most exclusive hangouts is the open-air Up & Above Bar, a semi-circle of plush seats that balance off the building's west side. The bar will serve fine cocktails, champagne and special tapas. To open later this month is Yamazato and Elements. Yamazato restaurants are famous throughout the world for perfecting the art of Kaiseki Ryori—a style of Japanese haute cuisine. If Yamazato is all about tradition than the Yin to Yamazato's Yang is Elements. Featuring modern logical cuisine in a living room style space, Elements breaks away from the norm, and presents wholesome food with edgy reinterpretations.